Middle East Perspectives by Rick Francona: Can Pakistan's forces take on the Taliban? Can Pakistan's forces take on the Taliban? Actually, the better question might be, Will Pakistan's forces take on the Taliban? Pakistan has always had a large and capable military force, much like other parts of the world that had been part of the British Empire. Look also at India and Jordan - the British influence on their military forces is readily apparent - excellent, disciplined troops. The Pakistanis are well-trained, well-led and well-equipped. With the resources of the state, they should be able to deal with the internal threat posed by the Taliban in the northwest part of the country. There are complicating factors, to be sure. There are about four million Afghan refugees in that area of Pakistan, and many of these refugees support the Taliban and the remaining remnants of al-Qa'idah. It is obvious from the hundreds of thousands of people fleeing the Swat Valley - some say as many as 500,000 Pakistanis have fled - that not all of the local population wants the Taliban in charge, nor do they support the Taliban interpretation of Islamic shari'a law. It is a given that in the Federally Administered Tribal Areas where the government has limited sovereignty the population is not in favor of the presence of the Pakistan Army. 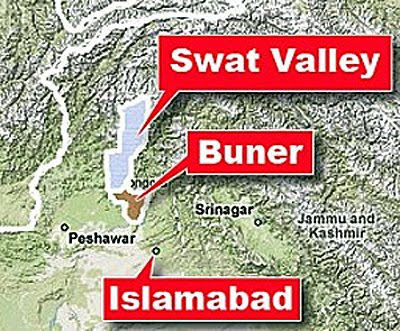 However, we are now talking about the North-West Frontier Province's Swat Valley and Buner District. Buner is only 70 miles from the capital of Islamabad. This is not the rabidly Pushtun area along the Afghan border - this is close to the heartland of the country. The government made a deal with the Taliban in February allowing the fundamentalist Islamic militia group to impose Islamic law in the Swat Valley, 100 miles from the capital. In return, the Taliban agreed to a ceasefire with the Pakistan military. That agreement was short-lived as the Taliban then moved into the Buner District. Making agreements with the Taliban is always a mistake - I hope President Obama is paying attention. See Pakistan caves to the militants and Obama's outreach to the Taliban - a victory for the terrorists. With the Taliban on the move ever closer to the capital, the Pakistani leadership had no choice but to commit the armed forces to the fight. 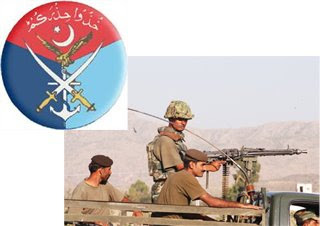 Now comes the real test - will the Pakistanis serving in the armed forces take up arms against the Taliban? On the surface, it appears that they have, but only time will tell. Pakistan is a country made up of different ethnic and tribal groups. The Pakistan armed forces are mostly Punjabi, but almost one-quarter of the military are Pushtuns. There has been, and still is, a question of whether or not they would side with the government or with their brother Pushtuns - the predominant ethnic group in the Taliban. Complicating this is the large numbers of Pushtuns in Pakistan's intelligence service, the Inter-Services Intelligence directorate. The ISI had a leading role in the creation of the Taliban and worked closely with al-Qa'idah in the past. These loyalties present a challenge for the government in Islamabad. A major concern for the rest of the world is not who is in charge of Buner or Swat, it is who controls the country's nuclear weapons and delivery systems (F-16 fighters and ballistic missiles). The head of Pakistan's armed forces declared that his troops are capable of securing the weapons. The U.S. Chairman of the Joint Chiefs of Staff, Admiral Mike Mullen, stated that he believed the weapons were safe. President Obama, during a news conference, almost dismissively in tone, stated that Pakistan's nuclear weapons were secure and quickly moved on to another subject. I suspect there is more to this than he wants to talk about. No one wants Pakistan's nuclear weapons in the hands of the Taliban or al-Qa'idah. The ramifications are almost too cataclysmic to contemplate. Undoubtedly there are contingency plans for American special operations forces (possibly jointly with Indian commandos) to secure or remove the Pakistani nukes. I hope so. For now, though, let's hope that the Pakistani military can overlook ethnic loyalties and defeat the Taliban.